Good morning. Today L.I. 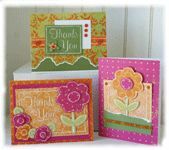 has posted my second card kit on their Home Page. Take a peek ... "A Bunch of Thanks" looks cute. Let me know if you have any questions re same or need any supplies. That looks so cute!! Congrats on the kit, what an honor! i love these colors. looked at the li website. how come your name is not on the kit as the designer?just wondering. did i miss it? It's a beautiful day in San Diego!